In Atmore, Alabama, originally called Williams Station, place that plays a pivotal role in Your Gift to Me (YGTM). Was your family a reading or a writing family? A college journalism major and teacher, my mother made sure books were always an important part of our home. How did you come to have a co-writer and how does that work? In 1996, my husband Tom and I “met” Bob Vale online in CompuServe’s professional military forum. Bob lived in New Jersey with his wife and two sons; Tom and I were in Hawaii where Tom was stationed. The forum owner soon asked Bob and me to write for and edit the Humor in Uniform electronic bulletin board. Although we’ve still never met we have been writing together professionally ever since. Can you share your publishing story in a paragraph or two? Bob and I have shared a by-line for Opinion-editorial and feature stories for The Mobile (AL) Press Register, The Birmingham (AL) News, other smaller newspapers and magazines, and for his clients at Graphic Word, a full-service East Coast creative agency. Being geographically separated was a bigger challenge in creating our novel. It took about three years to complete the initial manuscript and another a decade to perfect while querying literary agents. In the interim, our novel grew from classic light romance, called Forever E-mail, into a meaningful story that attracts men and women who desire entertainment and substance in their leisure reading. After almost two more years, we reluctantly, but amicably, parted ways with our agent and self-published on Amazon. Bob created our cover and formatted the paperback and electronic formats as if the novel were traditionally published. I believe that’s one reason YGTM has done well in three national contests. If a book isn’t properly formatted, it doesn’t get to the next level of competition. Do you have an out of the house job? I formed an LLC to freelance and edit for various publications and clients. I also speak about YGTM at libraries, civic clubs, churches, and military bases. From 2008 until 2012, I was a literary critic for Alabama’s oldest newspaper, the Mobile Press Register. As a “shade-tree historian,” I also do a lot of volunteer work with the local Chamber of Commerce, teaching local history (in period costume) to various groups including Atmore’s Leadership program. Are you a minister? How and why did that happen? I am licensed by the Episcopal Diocese of the Central Gulf Coast as a Lay Eucharistic Minister, Eucharistic Visitor, and Worship Leader. Writing YGTM made me acutely aware that my faith and early Episcopal roots were the core of my very existence. I truly felt called to write this novel. I never understood the driving compulsion; I just accepted it. Writing this story set me on a spiritual path that changed my life and personality in unexpected ways. I am working for Bob’s creative agency as editor on a fascinating non-fiction book about three generations of European immigration. My next book will be a collection of articles I’ve had published in Stars and Stripes/Europe, Air Force Times, and various other publications. We have so much in common including PTSD. Was it difficult to write about the disorder in YGTM? Those are very good and intuitive questions, Doreen! It wasn’t particularly difficult because I didn’t realize I had PTSD until just before the book published. However, writing it was cathartic! The female protagonist in YGTM suffers from smoke nightmares, which began after she suffered a double traumatic loss in a short period of time. I ‘gave’ Emily the type nightmares I had for twenty years following three shocking deaths of my father and two close friends in two unrelated incidents—all within thirty hours. It took a Vietnam War veteran to diagnose my classic PTSD, which didn’t end until we published YGTM. YGTM is not a quick, light read. Although the subject matter is deep, there is also a comic relief and a mystical love story. Book clubs from California to Georgia and Illinois to Alabama have chosen YGTM as their monthly read. Although YGTM is not Christian fiction, Bob and I are both Christians who write. Our world-view is reflected in our novel. Although our book is patriotic and pro-military, it is not political. Incorporating my professional background as a columnist for Stars and Stripes and my personal background as an Air Force wife, I wrote virtually all of the hard-charging military scenes and sub-plot; Bob wrote much of the lyrical prose. Although he has never served in the military, he is a huge military supporter and fan of the Wounded Warrior Project. 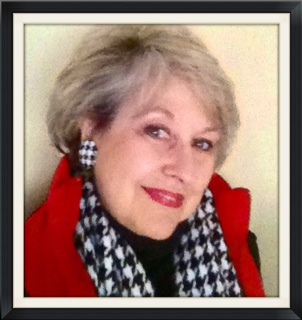 Bonnie lives in SW Alabama with her husband, retired Air Force Colonel Tom Latino and their Bichon Frise, Sweetie Pie. Bob and Janice live near the Jersey Shore with their Yorkie, Lucy. They have two adult sons. After a month of international online voting, her flash fiction won the People’s Choice Award in 2009. In 2011, Bonnie’s narrative non-fiction won the William E. Mayer Award for Literary or Artistic Excellence. I highly recommend this book. 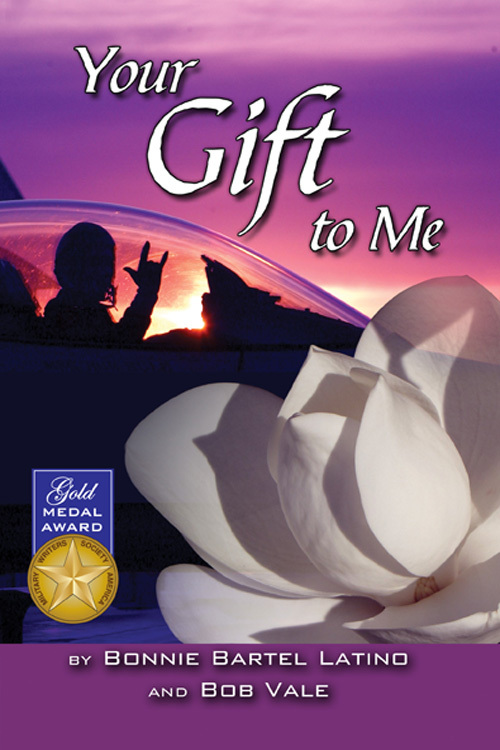 Your Gift to Me is available at Amazon in paper and eBook formats. In this current yet timeless story recent widower and Air Force fighter pilot Ted Foley falls for a journalist who also happens to be the widow of a fallen fighter pilot. After ten –years, Emily Meade was still trying to make it through the night before being consumed by her own grief and panic attacks. She had no intentions, of giving her broken heart to anyone, especially not another flyer. This is not just a military love story. There is mystery and suspense. Emily’s off the wall next- door neighbor provides breaks of humor in contrast to the drama. This is a sensitive and passionately written life story. It validates the fear our military spouses live with each and every day of their lives. It is a great tribute to them and for us civilians offers a window into their lives that we rarely if ever get to see. This story although fiction is written with such emotion one cannot help but believe these characters are rooted in reality. I hope the authors are planning a sequel. I cannot get these characters out of my head. you’ve done on his behalf. Thank you again for the opportunity to contribute to your blog.